A vehicle’s brake system should always be kept in top working condition in order to ensure you and your family’s safety on the road. At Eagle Automotive Service in Littleton, CO, our ASE certified technicians are highly experienced and specially trained to repair and service brake systems on all makes and models of vehicles. It is important to have your vehicle’s brake system inspected regularly to perform necessary services and repairs to prevent unexpected problems and failures. If you notice that your vehicle’s Brake Warning Light has turned on, more than likely there is problem with your brake system. You may also notice other symptoms while driving that can indicate a problem with your brakes. All of the symptoms above can indicate that something is wrong with your vehicle’s brakes. Bring your vehicle into our Littleton auto repair shop at the first sign of a problem. A brake issue can stem from issues with a few different components, but more than likely your vehicle’s brake pads or rotors may need replacing. Brake fluid also needs to be changed regularly because old oil can often corrode brake system components and cause performance problems. Brake fluid helps to remove excess moisture in the system and keeps your brakes running smoothly. Our experts will run computer diagnostics on your vehicle and will also perform a visual inspection of your brakes to determine the exact cause of the issue. Regardless of the problem at hand, our experts will repair your vehicle correctly the first time and will have you back on the road safely quickly. 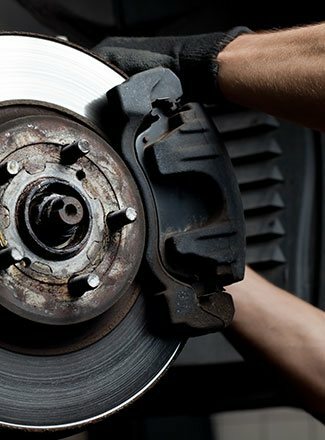 If you suspect a problem with your brakes, bring your vehicle into the experts here at Eagle Automotive Service.